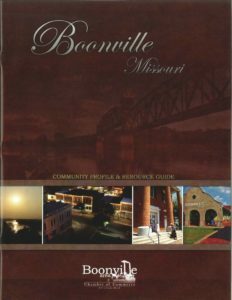 The Boonville Community Profile & Resource Guide (sometimes referred to as “The Brown Book”), last printed in 2011, is being revised, updated, and readied for printing. The Chamber’s goal is to produce a comprehensive, useful guide to showcase local businesses, professional services, area parks, events, area attractions, and anything else that makes us The Boonslick. It is printed in full color on heavier weight glossy paper and will be available to visitors or prospective residents who contact the Chamber for information. It will be available at the Boonville Visitors Center and other local businesses. In addition to containing a business directory, the Guide will include various categories which highlight education, healthcare, senior living programs, opportunities for volunteerism, and much more. Along with your business’ directory listing, you can place an advertisement with sizes ranging from full page to 1/16 of a page. Please see the graphic in the lower right for ad pricing. A member of the Chamber Board will be contacting you to determine your interest in placing an ad. 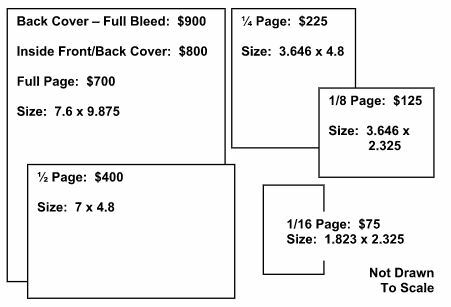 Remember, these Guides are widely circulated and only printed when supply demands, meaning that a $400 half-page ad printed in a bulk run of 3,000 has the potential to reach 3,000 shoppers at a cost of only 13¢ per person. It will be the wisest thirteen cents you ever spent on advertising. But, hurry — ads are being sold on a first-come, first served basis. The Guide also has a section for Service Organizations. If you belong or know who to contact for an organization, please forward as well. The last Guide listed the organization name, day, time and meeting location. A Business Directory is printed on the last few pages of the Guide, showing your business name, phone number, web address. This contact information can potentially appear numerous times in the Directory based on the product or service available, i.e., a bank may be listed under Bank but also appear under Investments; a veterinarian can be shown under Animal Boarding as well as Veterinarian; a florist can be listed under Florist or Gifts or Wedding Services or all three. To simplify data collection, attached is a form to be completed and returned to the Chamber no later than March 15, 2017 if your business is to be listed in the Guide. If you are submitting your business information after the March 15 deadline, your information will be retained and included in the next printing, anticipated to be in 2019 or sooner if the supply is depleted. If you have any questions, please contact the Chamber at 660.882.2721. Where should we contact you about advertising?